The U.S.population over the age of 65 has grown 3 times faster than the population under 65, with a 30-year life-expectancy increase in the past 100 years. We are living longer, but not necessarily healthier. Risks of suffering from chronic, limiting conditions such as arthritis, diabetes, osteoporosis, and dementia increase with age. As more people live into their 80s and 90s, more people require custodial care, supervision, and assistance performing activities of daily living. Nearly half of our six million adults over age 85 need assistance performing everyday activities such as keeping the house, preparing meals, bathing, and getting around in and outside the home. In response to their gradual loss of independence, family members step up and become caregivers, assuming responsibility for guarding their health, safety, and dignity. Family caregivers (unpaid) provide 83% percent of the help provided to older adults. They also help mitigate other factors associated with increased dependency, such as loss of social outlets, loneliness, depression, and apathy. Many seniors have in their closest relative not only their sole caregiver but also their single source of social contact. Decline in social engagement is directly correlated to loss of independence. Many older and dependent adults suffer from loneliness and lack of social contact, resulting in high levels of depression and increased dependency on their caregivers. Adult day care is a wonderful outlet for social interaction to people who otherwise would be spending most of their time alone. Participants in day centers enjoy companionship and camaraderie in a safe and nurturing environment where they are welcomed with dignity and respect. 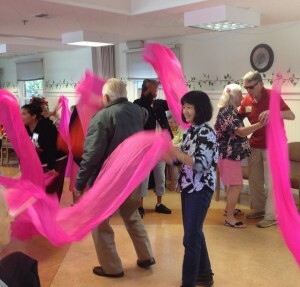 Socialization is also an important component in the fight against cognitive decline. Patients with mild cognitive impairment (MCI), Alzheimer’s, and other forms of dementia all benefit from habitual social interaction. However, cognitive decline itself may cause patients to feel uncomfortable in settings previously found enjoyable. While opportunities for social gatherings dwindle, adult day centers become the most important social outlet for those patients. Adult day care is an antidote for boredom! Participants are encouraged to take part in engaging group activities including physical exercise, entertainment, music, art, games, and planned outings. 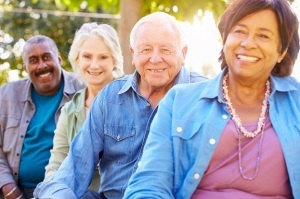 Participation in these stimulating activities helps maintain memory, foster emotional connections with others, encourage self-expression, and lessen emotional symptoms such as anxiety, depression, apathy, and irritability. All these benefits are instrumental in preserving living skills and promoting independence. Regular attendance also provides a sense of purpose, which is an important contributing factor to well-being. And don’t forget: it is fun! Adult day care staff members become partners in care with the caregiver, helping monitor the health of their care recipients. Their trained eyes are an invaluable resource in identifying changes in health status and alerting the caregiver for needed medical interventions or evaluations. They can also assist with care-planning, referrals, caregiver education, and support. The sheer amount of work it takes to care for their loved ones can become overwhelming to family caregivers. With medical schedules, physical exertions, and constant having to meet their needs, caregivers often find themselves stressed under the pressure of day-to-day demands. Participation in adult day care structured activities provides valuable respite to caregivers, allowing them to take care of their own needs and take some time for themselves. Caregiving duties relief promotes lowering stress levels and prolonging the ability to give care over time. Day care centers are an economical option, costing a fraction of in-home care services. In addition, meals are provided, which further relieves caregivers of duties related to meal preparation and delivery. Family caregivers who use adult day services experience fewer depressive symptoms than those who do not. Regular, continuous respite allows caregivers to regain a sense of normalcy and better cope with the many stressors of caregiving. Caregiver fatigue, patient’s emotional disturbances, and escalation of dependency levels are some of the major causes for institutionalization. Adult day services can help lessen all of those factors, which results in the participants’ prolonged ability to keep living in their own home as they age. Financial strain is also a strong reason for a move into a nursing home and relieving some of the financial stress is instrumental in keeping people at home. Adult day care is an economical care option. Participation in adult day care activities helps delay institutionalization for an average of three years. 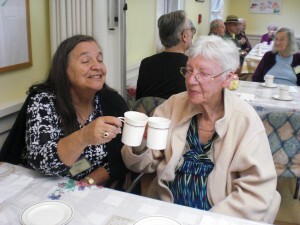 Friendship Center is a non-profit organization and a model of social settings for seniors at risk for isolation. With two sites in Montecito and Goleta, Friendship Center has socially-based programs for all levels of cognitive abilities. From Brain Fitness classes, designed to improve brain capacity for healthy aging adults, to Connections, an ongoing brain strengthening lab for memory enhancement, to our day program for those affected with memory loss and other health conditions who need supervision, care, and social interaction—Friendship Center’s services can help seniors remain healthy and active! Call Friendship Center or an adult day center near you and ask about available services. Do not let social isolation contribute to your loved one’s health problems. My wife is talking about getting a caregiver for her dad so thanks for sharing this. I like your point about how caregivers can help with monitoring health and medication. Having someone there that can ensure he takes his medications would take a lot of stress off of her. We can definitely take care of that for your father-in-law at our center. Medications are administered at each member’s scheduled times by our friendly, professionally trained staff. We do our best not to make it a big deal for our members, and we’ll come to them at whatever activity they are taking part in. We’re to help you have peace of mind during the day.